The majority of reviewers of the Adidas Predator 19.3 Firm Ground football boot agree that the pair is comfortable to wear. Most of this firm ground soccer cleat’s patrons acknowledged the pair’s stylish look. A couple of users noted that this soccer shoe is a good value for money. The shoe's Primemesh upper makes sure that it's breathable. The 19.3 version of the Adidas Copa is of high quality, noted a patron. This soccers shoe brings a good grip for its wearers. A handful of reviewers had some sizing issues; some are advising potential buyers to go half a size up for the best possible fit. The stylish Adidas Predator 19.3 Firm Ground football shoe is just as good as its laceless option. The pair has checked out in terms of comfort, noted most of its users. It also brings good value for money, discovered a number of delighted purchasers. However, a small number of customers have indicated that the pair’s sizing is about half a size smaller than usual. They recommended going half a size up to get the best possible fit. On feet, the Adidas Predator 19.3 does feel okay. I wouldnt say that it feels cheap in any way. It's mesh-based upper which is basically not gonna feel too far off a knitted-base upper. The Adidas Predator 19.3 Firm Ground football shoe is one for comfort and grip in the field. Sporting an ankle high Primemesh-based upper, it brings a supportive, sock-like feel as it ensures a great fit through its anatomical design. The mesh-based material brings a second-skin-like feel while maximizing the soccer shoe’s snugness. A central lacing system adds to the fit, as well, by bringing in an element of customizability. Ball control is made much more pronounced by the embossings found on the vamp. The Thermoplastic polyurethane (TPU)-injected layers outsole of this model provides stability, traction and grip for firm ground courts. An eleven-geometric-stud configuration is integrated into this model. The Adidas Predator 19.3 Firm Ground football cleat brings a comfortable fit through its Primemesh upper. The material wraps around the wearer’s foot that allows for a snug, sock-like fit. A central lacing system aids the wearer in personalizing this soccer shoe’s fit. This football boot model is made available in men’s standard sizes ranging from 7 to 12.5. Another important piece of information mentioned by a couple of reviewers is that this soccer shoe is a half size small. Some recommended going for a half size larger or even visiting the nearest Adidas store to try on a pair. The mid-top upper of the Adidas Predator 19.3 FG soccer boot is created out of a Primemesh-based material that is anatomically designed to mimic the natural contours of the wearer’s foot. This form-fitting sock-like element also achieves a snug feel. A central lacing has been introduced into this model’s design, as well. This feature allows for fit customization. Ball control is ensured by an embossing in the upper area. For traction and grip in firm ground courts, a TPU is used in the construction of the soleplate. The material is known for its durability, which is why it is a common element among soccer cleats. The stud configuration is designed to bring stability during play. A total of eleven geometric studs are used; seven are found in the forefoot and four in the heel area. 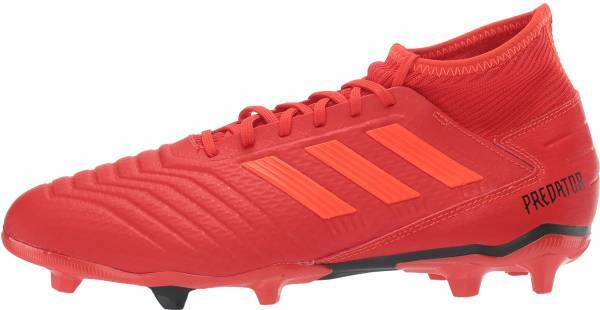 The Adidas Predator 19.3 FG football boot is available in the Active Red and Core Black colorway. This shoe model is also part of the Adidas Initiator pack.